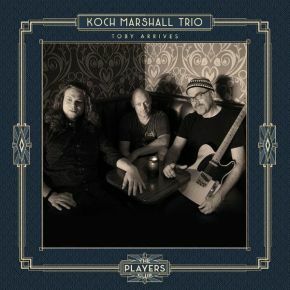 The Mascot Label Group’s new imprint The Players Club are thrilled to announce the debut album from The Koch Marshall Trio, Toby Arrives, which will be released on 23rd February 2018. At the heart of this organ trio is a blues sensibility - but Koch's compositions are an amalgam of rock, funk, jazz and country served up with heavy grooves and dynamic improvisations delivered with no small dose of humour and occasional wild abandon. Milwaukee native Greg Koch has forged a successful career as a guitar player's guitarist and has been called "scary good" by guitar phenomenon Joe Bonamassa. In addition to his 15 releases on multiple record labels which feature his unique take on a variety of American guitar styles and his versatile compositions, Koch is widely known for his lengthy tenure as an international ambassador for Fender Guitars. He is also a best-selling author and video instructor for music publisher Hal Leonard. For the last few years Greg is renowned for his wildly popular internet videos (which number in the thousands withviews exceeding 50 million) originating from the legendary Colorado guitar shop Wildwood Guitars. Dylan Koch gravitated to the drums early on in his life using kitchen utensils to play along with music as soon as he could walk. After digesting an early diet of Ginger Baker, Keith Moon, Mitch Mitchell and John Bonham, Dylan was mentored by the legendary Tom Brechtlein (Chick Corea/Robben Ford). While still in his teens he performed with young guitar guns Tallan Noble Latz and Jared James Nichols and has performed alongside his father with such artists as Robben Ford, Little Feat's Paul Barrere, Jon Cleary, David Grissom, Roscoe Beck and Malford Milligan. Toby Lee Marshall's screaming B3 is the perfect complement to the musical stew that is the Koch songbook. His fascination for the Hammond B3 took hold after his Dad took him to see Steve Cherewanplaying with Dr. Mambo's Combo at their legendary residency at Bunker's in Minneapolis. Steve mentored Toby in the ways of the B3 and he hit the ground running landing a gig with bluesman Lonnie Brookswhile still a teen. He would go on to travel the world as a member of Bernard Allison's band. After taking a hiatus to spend some family time, Toby is returning to music with a vehemence and the Koch-Marshall format gives him a long leash to let his freak flag fly, providing groovy bass lines, sinuous chordal work and incendiary solos. The trio blends the explosive guitar manipulations of Greg, the groove-centric, power-pocket playing of his son Dylan on drums (who share many telepathic musical moments) and the glorious, Hammond organ stylings of the uber-talented Toby Marshall, Greg’s compositions are properly portrayed in the blues drenched, funk, chicken-fried, gospelly, jazz-rock panorama in which they were conceived. Their first release, Toby Arrives the first moments of their unexpected musical partnership captured at an extemporaneous jam session earlier in the year.